One of our major concerns continues to be how we can support our Local Heroes even better. This is the reason behind our continuing to develop and work on our connected store concept. One component is of course also our marketing concept, which we believe should strengthen our local retailers, making them fit for the future. Bearing this in mind, we decided to tackle the old my-eXtra and network operators flyers and give them a new look. With the new Local Hero monthly flyer, retailers have an advertising tool at their disposal which enables them to be able to offer prices capable of competing with those on the internet whilst scoring at the same time with a local store. 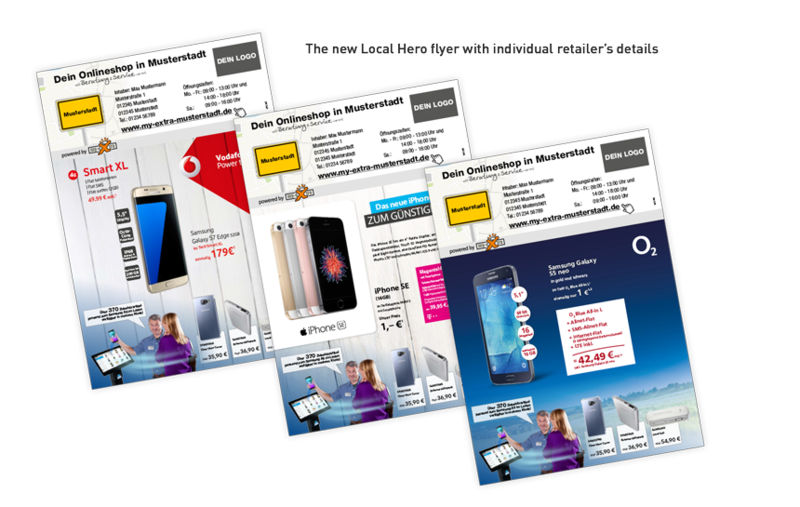 Whilst implementing our Local Hero concept, which shifts the focus onto local retailers, we realized that our old my-eXtra and network operator flyers were simply no longer in keeping with the times. Previously, the my-eXtra flyer was only used by my-eXtra cooperation partners. We have now taken the flyer and given it a whole new look, re-designing it entirely to make it suitable for all retailers to use. 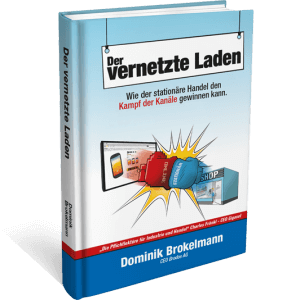 The newly designed flyer now stands out in particular from cheap-looking flyers, both in terms of the quality of the paper and in its appearance. It was important for us that the new monthly flyer reflected not only quality but also service and advice at prices in line with the market. The result is quite something. The new flyers are now smaller, in A4 format, giving them an even more superior appearance. They also stand for the quality of advice and service offered by the local store, even at reasonable prices. 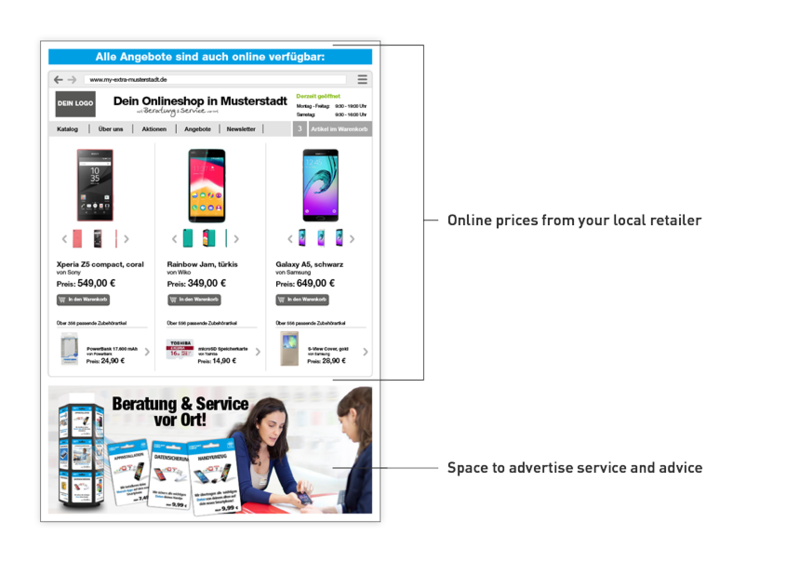 The cover sheet now carries the individual retailer’s details, including their domain, opening hours and logo as well as the latest offers. The inner section has also been given a facelift. From now on, this is devoted to one particular network operator. Retailers can, however, choose each month between the three network operators, giving them different options for varying their advertising. 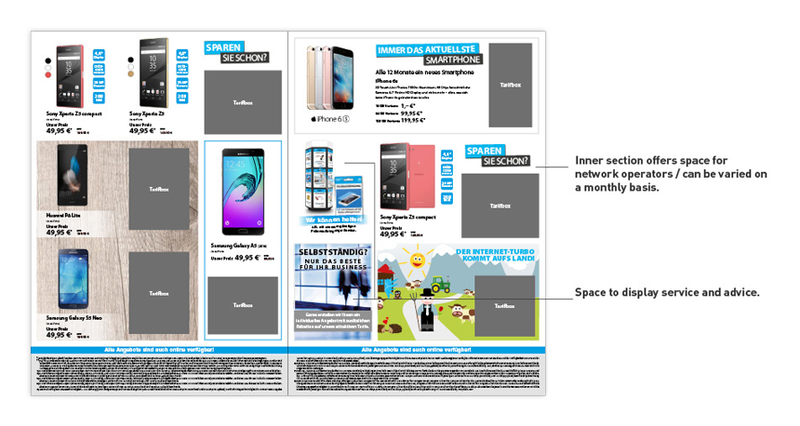 A small tip for our retailers: It is now much easier to cover costs for the monthly flyer if the retailer approaches the network operator’s sales force, who can then take the inner section to the network operator and present them with the pages focussing on their products. The network operator is now far more likely to offer financial support than if they had to share the available space with other network operators, as was the case in the past. Another new feature is the back page, which is kept in the same design as the retailer’s online shop, showing it in print form. This allows local retailers to promote their online shop on the internet, consolidating their position as a Local Hero. One page is devoted to hardware products available from the retailer. The prices we charge for our flyers are naturally also decided with the retailers’ interests in mind. Our Local Hero monthly flyer is easily able to keep up with online printers such as flyeralarm. We, however, offer much more than what you get in return for the printing costs which are charged online. The Local Hero basis set contains 5,000 flyers including layout and production, individual Local Hero retailer’s stamp, logistic services to the distribution center or store, 250 copies for the store as well as a poster set matching the flyer version. The set costs a total of just 349 euros, Local Hero retailers with a kiosk and online shop even get it for 199 euros. 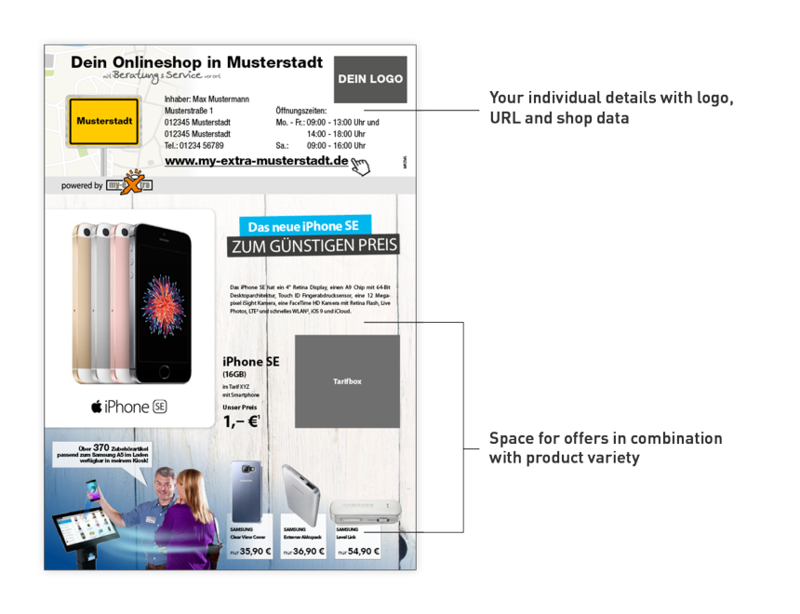 Just 24 euros is charged for every 1,000 additional flyers. The latest monthly flyer is available for order straightaway. It is published each second Saturday of the month. The order form for the new Local Hero monthly flyer is available here.